Take 1 cup of the tomatillo salsa and spread it out over the bottom of a 13 x 9-inch baking dish. Preheat your oven to 350 degrees. Add the following ingredients to a large mixing bowl, stirring to combine: chicken, 1 cup of cheese, 1 cup of the tomatillo salsa, green onions, cumin, chili powder, and salt. Take 2 heaping tablespoons of the chicken mixture and place it down the center of a tortilla, rolling the tortilla up and placing it in the baking dish afterwards. Repeat with remaining tortillas. Once all your rolled-up tortillas are in the baking dish, spread 1/2 cup of the salsa over them, putting a cover on the baking dish before it gets placed in the oven. Cook for 30 to 35 minutes in the oven or until the enchiladas are heated throughout. Take the baking dish out long enough to add on the rest of the salsa and cheese, placing it back in the oven for an extra 2 to 3 minutes or until the cheese has melted. We really enjoyed eating this. We would suggest keeping all the seeds in the serranos for the salsa though ’cause we didn’t get the heat nearly as much in the enchiladas as we did when we were just eating the salsa with chips. You do still get the brightness of the salsa though. Combine that with the cheese and meaty filling, you have a delicious dish. These enchiladas are pretty easy to make and depending on the amount of people you’re serving, could last you two days or more ! Peel the husks off the tomatillos, rinsing the tomatillos off afterwards. Take a large saucepan and add the tomatillos to it, pouring enough water in to cover the tomatillos (our tomatillos started floating so we never truly got to “cover” them). Set the saucepan over high enough heat for boiling to occur (we went with medium-high heat). Once boiling, turn the heat down to medium, putting a lid on the saucepan next. Let the tomatillos cook for 8 to 10 minutes or until they’re soft, transferring them to either a food processor with a metal blade or a blender (we used a blender). Pulse the tomatillos just until they look smooth. Place the tomatillos in a large mixing bowl with the other ingredients, stirring to combine. Oh man, this salsa tastes so good ! 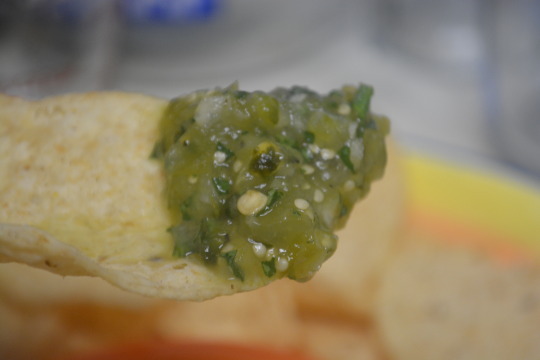 The tomatillos and lime juice bring a bright acidity to the salsa but you still get a nice heat from the serranos. The onion brings a crunch and a bit of sharp flavor, which contrasts to the smooth tomatillos. This salsa is called for in a chicken enchilada recipe we’ll be making that should end up being delicious if this salsa is any indication ! Adjust your oven rack so that it’s 6 inches from the broiler element, preheating your broiler afterwards. Take a rimmed baking sheet and line it with aluminum foil. Place the poblanos and tomatillos on the lined baking sheet, pouring 1 teaspoon of oil over them afterwards. Toss the poblanos and tomatillos so they’re completely coated in the oil. Make sure the tomatillos are facing cut side and the poblano skins are facing up before sticking the sheet in the oven. Broil for 5 to 10 minutes or until the vegetables look blackened and have begun to soften (10 minutes seemed to do the job for the poblanos, we left the tomatillos in longer). Take the poblanos and place them in a large enough bowl, covering the top of the bowl with foil and letting it steam for 10 minutes or until the skin peels off easily. Use the back of a spoon to scrape the loosened skin off the poblanos (it was easy enough to peel the skin off just using our hands). Chop the tomatillos and poblanos into ½-inch pieces. Add the tomatillos, 1 tablespoon oil, 1 cup onion, ½ cup cilantro, broth, cream, half of the garlic, lime juice, sugar and 1 teaspoon of salt (we used table salt) to a food processor, processing the mixture for 2 minutes or until smooth. Season the tomatillo sauce with salt (we used kosher salt) and pepper to taste. Take a 12-inch skillet out and pour 1 tablespoon of the oil into it, setting the heat to medium. Once the oil’s shimmering, add in the remaining onion, stirring for 5 to 7 minutes or until the onion’s softened. Now add in the chili powder, coriander, cumin and the remaining garlic, stirring for 30 seconds or until fragrant. Add in the mashed and whole beans as well as the poblanos, stirring for 2 minutes or until they’re warmed through. Take the skillet mixture and add it to a large mixing bowl, letting it cool slightly afterwards. Add 1 cup of the shredded cheese, ½ cup of the tomatillo sauce, and the remaining ½ cup cilantro to the large mixing bowl, stirring to combine. Season with salt and pepper to taste. Move your oven rack to the middle position, preheating the oven to 400 degrees afterwards. Take a 13 x 9-inch baking dish out and spread ½ cup of the tomatillo sauce over the bottom of it. Brush both sides of the tortillas with the remaining 2 tablespoons of oil, stacking them afterwards. Wrap the tortillas in a damp dish towel, placing them on a plate afterwards. Microwave the tortillas for 1 minute or until they’re warm and pliable (we just heated the tortillas up one at a time in skillet (without any oil) over low heat). Working with just 1 warm tortilla at a time, spread ¼ cup of the bean-cheese mixture down the center of the tortilla. Roll the tortilla up tightly around the filling and place it seam-side down in the baking dish, repeating until you have two columns of enchiladas in the baking dish. Pour the remaining tomatillo sauce over the enchiladas, sprinkling the remaining cheese on afterwards. Grease a big enough sheet of aluminum foil to cover the top of the baking dish (we used nonstick cooking spray), laying it over the dish afterwards, wrapping it tightly around the edges. Put the dish in the oven for 15 to 20 minutes or until the cheese has melted and the enchiladas are heated all the way through. Let the enchiladas cool for 5 minutes before eating. 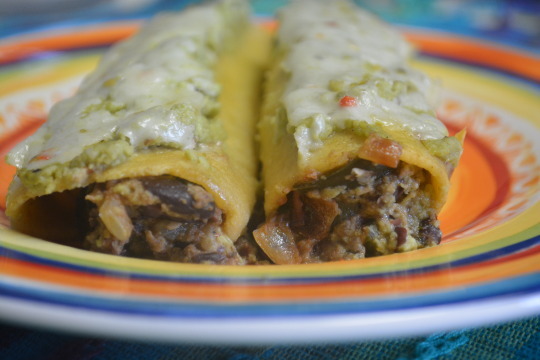 This is a great vegetarian enchilada with a citrus-y zing to it. You’ll enjoy this whether you’re a vegetarian or not ! We weren’t paid in any form to promote Bush’s or America’s Test Kitchen. Start off by making the pulled pork. Take a 6-qt. slow cooker out and lightly grease the inside of it. Add the pork to the slow cooker, pouring the barbecue sauce and cola over it afterwards. Put the lid on the slow cooker and let it cook on LOW for 8 to 10 hours or until the meat is tender enough that it shreds easily with a fork. Take the pork out of the slow cooker and shred it using two forks, throwing away any large pieces of fat that you come across. Try to skim the fat off the sauce before stirring the shredded pork back in. Preheat your oven to 450 degrees. Take a large rimmed baking sheet out and line it with aluminum foil. Take a large mixing bowl out and mix the tomatillos, onion, jalapeño, garlic, oil, salt and pepper together. Spread the mixture out on the lined baking sheet. Place the sheet in the oven for 10 minutes or until softened (ours took somewhere between 10-15 minutes and we flipped ours over after the initial 10 minutes). 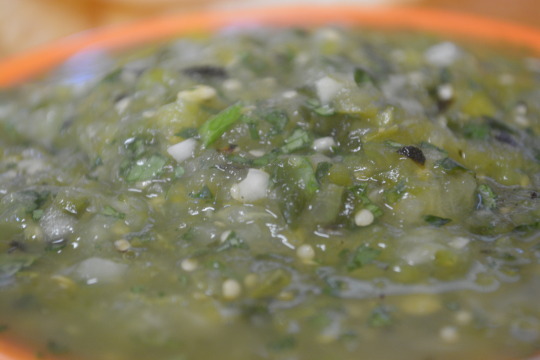 Take the roasted tomatillo mixture, cilantro and lime juice and place it in a blender, processing long enough for it to turn into a smooth sauce. 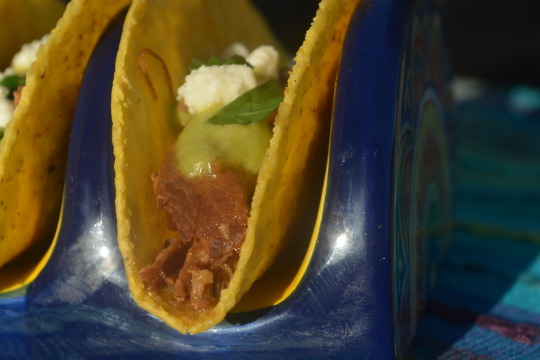 Fill up the taco shell with pork and top with the tomatillo sauce, chopped tomato and queso fresco. Sprinkle the chopped cilantro on afterwards and enjoy ! The pork has a sweetness to it thanks to the sauce but it’s also dripping with the sauce it was sitting in so make sure you have some napkins or paper towels with you while eating this. The tomatillo sauce has so much brightness to it. We were surprise that we didn’t get any heat from the sauce even though we left the ribs and seeds in for the jalapeño. Had we used tomatoes, it would’ve added more flavor and brought a different texture to the dish but we still enjoyed the taco regardless ! 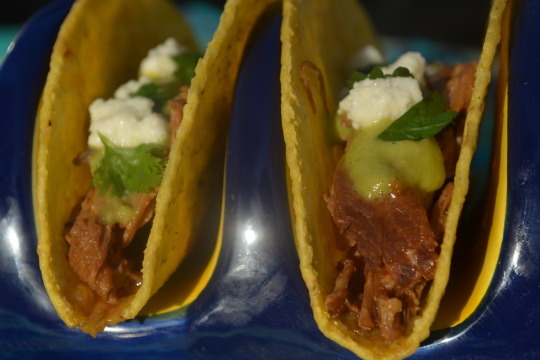 We got the Three-Ingredient Slow-Cooker Barbecue Pork recipe from Southern Living but we don’t know where we got the BBQ Tomatillo Tacos recipe from. We weren’t paid in any form to promote Cattlemen’s, Jack Daniel’s, Coca-Cola or Southern Living. Pour the oil into a large skillet, setting the heat to high. 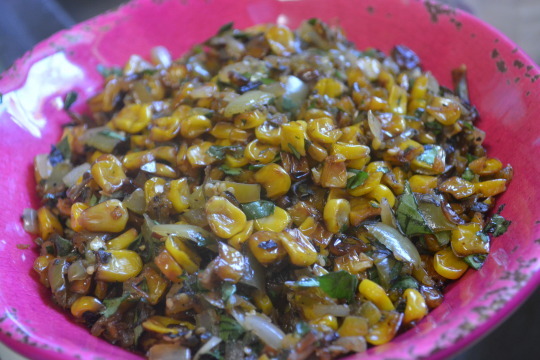 Once the oil’s hot, add in the corn, stirring constantly until the corn has a light brown appearance. Add in the tomatillos, onion and jalapeños, stirring for 3 minutes or until the tomatillos soften. Take a bite and season the dish with salt and pepper. 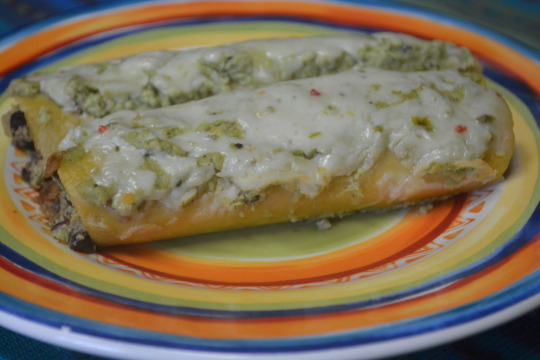 Mix in the cilantro and oregano and enjoy ! My father liked this so much, he couldn’t stay away from it ! We got this recipe from CuisineTonight. We weren’t paid in any form to promote CuisineTonight. Preheat your broil (the recipe never says to, but we’d recommend moving your oven rack up one from the middle). Take a rimmed baking sheet and spray it with nonstick cooking spray (we lined our baking sheet with aluminum foil and then sprayed the foil with nonstick cooking spray). Cut the tomatillos and poblano in half, placing them on the baking sheet (cut-side down) afterwards. Stick them in the oven to broil for 5 minutes or until they are soft and look slightly charred (the original recipe does mention that you may need to remove some pieces before others). Once soft and slightly charred, take them out of the oven an off the baking sheet so they can cool down to room temperature. Take the lid off your food processor and add to it the tomatillos, poblano, onion, cilantro, lime juice, garlic, salt and pepper. 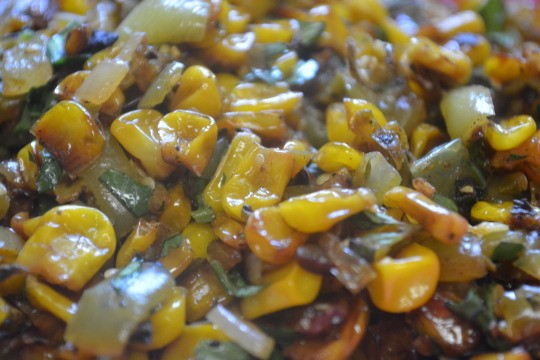 Pulse or process just long enough for the vegetables to get chopped and the salsa becomes slightly liquid. Put the salsa in a container, put the lid on it and let it sit in the fridge for at least 2 hours to get cold. If the salsa is stored in an airtight container it can last for up to a week. This salsa is like chili, good the first day but even better the second ! This recipe came from a Paula Deen magazine. We weren’t paid in any form to promote Paula Deen’s magazine.